Proverbs 3:5-6 says it this way, "Trust in the Lord with all you heart and lean not to your own understanding and in all thy ways acknowledge Him and He shall direct your path"
I used to look at trusting God as a one off sorta thing, as situations or crisis would arise I would really focus on trusting God. The verse mentioned above I've known since I was a child and could recite it at an early age but it wasn't until adulthood that I actually learned the verses. For many years I thought that I could figure things out on my own and neglected to trust God for all things - I leaned to my own understanding. Trust in God is not a part-time job but rather it's a lifetime career path that you never retire from. Trusting God pays off, he will never lead you in the wrong direction, he is ever merciful, gracious, loving and faithful toward us. So when you can't figure it out - trust God! When you can't find your way - trust God! When you feel like you're in this thing called life by yourself - trust God! God will never leave you or forsake you He is always right there! 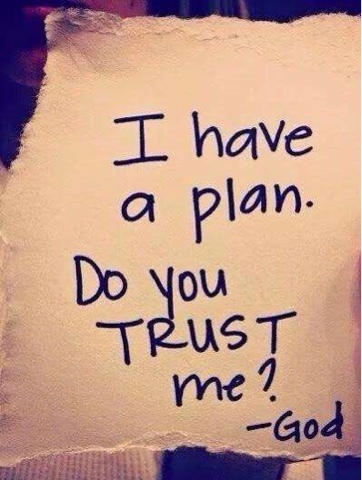 Trust Him even when you can't trace Him or track Him! Put your trust in the Lord, He will see you through!